(Syd Stone/Daily Senior Staffer) Locals buy produce at the downtown Evanston farmers market. 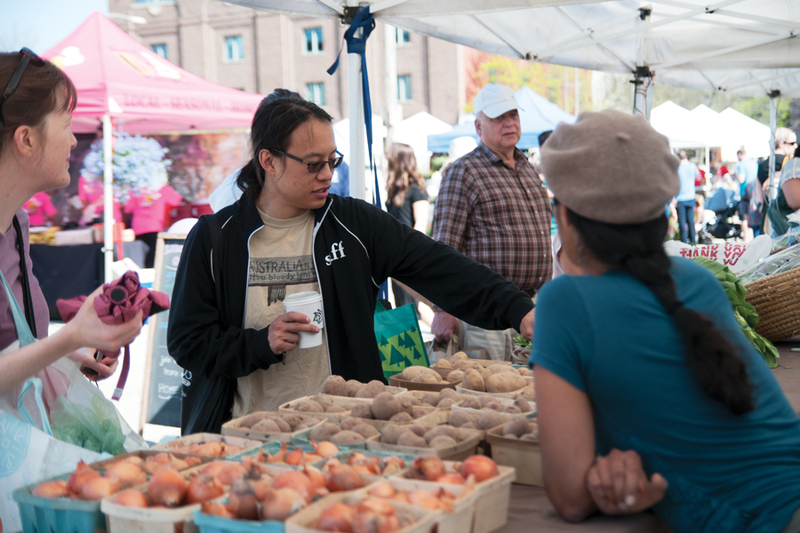 The market opened for the season Saturday with nine new vendors. Evanston residents flocked to the downtown farmers market Saturday, stopping by to stock up on everything from fresh bread and vegetables to crepes and homemade pies as they enjoyed the 80-degree temperatures. The market, located in the parking lot on University Place and Oak Avenue, opened for the 2018 season Saturday with nine new vendors, bringing the total number of vendors to 61, according to the city’s website. Evanston farmers market manager Myra Gorman said the number of new vendors this year is in line with past years numbers. For the first time this year, Collective Resource, an Evanston-based food scrap collection service that has partnered with the city, will be at the market each weekend. Collective Resource will collect food scraps from vendors, Gorman said, and market-goers will also be able to sign up for the composting service at the tent. Edward Meliunas, owner of Windmill Ginger Brew, is one of this year’s new vendors. Meliunas makes and sells ginger beer in various flavors — such as pomegranate rosemary and guava — and is based out of Geneva, Illinois. He said he has stands at eight other farmers markets. “We bring the product to new communities and (the farmers market is) how we introduce our product to communities,” Meliunas said. Meliunas said Windmill Ginger Brew is also being sold at Farmhouse, 703 Church St., and NaKorn, 1622 Orrington Ave. He added he is working to get his product into grocery stores. Soap of the Earth owner Lori Hoyt is new to the Evanston farmers market as well but said she is in her 10th farmers market season selling her homemade soaps. Shannon Sudduth, owner of Evanston-based chocolate business Noir d’Ebène, had been in the Evanston farmers market for several years but decided to take a break last season, noting that the market is a lot of work and that she is the primary operator of the business. Sudduth said she returned this year and is excited to be back. She described her process for making chocolates as “bean to bar” — she imports whole cacao beans from around the world and roasts them to create her chocolate bars and other treats in a week-long process — and is based out of Family Focus Evanston, a community center at 2010 Dewey Ave.